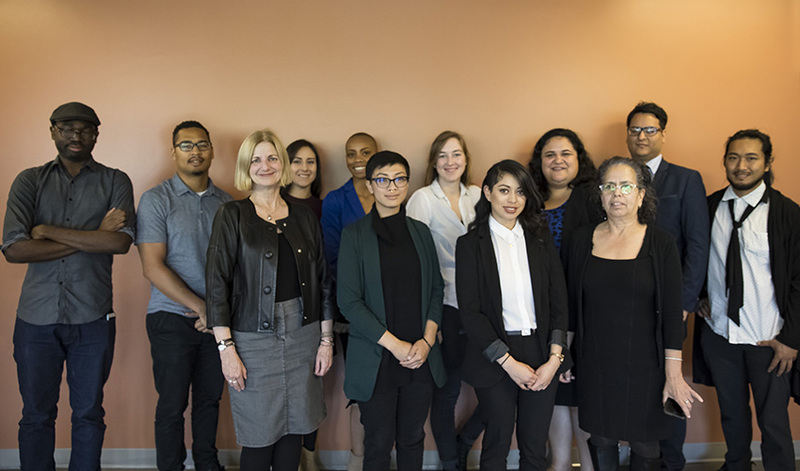 The majority of San Francisco State University's Pre-Doctoral Scholars attended an orientation for the program on October 5. When Francesca Colonnese wants insights into Renaissance poetry, which she’s studying as she works toward an M.A. in English language and literature at San Francisco State University, she pores over old manuscripts in the Sutro Library. But when she needed a clearer picture of her own future, she turned elsewhere: to the California Pre-Doctoral Program, an initiative that supports the doctoral ambitions of students at the 23 California State University (CSU) campuses. “Participating in the Pre-Doctoral Program made all the difference, both in applying for doctoral programs and preparing me for what the graduate school world would look like,” Colonnese said. Colonnese is one of 74 students chosen for this year’s program, which is sponsored by the CSU Foundation. Eleven of those students come from San Francisco State, the second most in the CSU system after California State University, Northridge, which had 14. Recipients — known as pre-doctoral scholars — receive a $3,000 award that can be used toward developmental activities, such as attending conferences, visiting other doctorate-granting institutions and covering graduate examination preparation and fees. Students are also recommended and mentored by a faculty sponsor. Now she’s channeling those observations into psychology research, planning a series of four-week programs in San Francisco public elementary schools to teach students about how stereotypes affect learning. She and her research assistants will measure logical/spatial intelligence and the students’ sense of belonging before and after the program to see if this knowledge can promote resilience to stereotypes. Meanwhile, the pre-doctoral scholarship will help Baaqee cover travel expenses and application and testing fees as she seeks out a Ph.D. program — the first step toward her goal of producing impactful research. “Decades down the road, I would like my research to be something that inspires other students the same way that so many researchers have inspired me,” she said. SF State pre-doctoral scholars, also known as Sally Casanova Scholars, have successfully leveraged the fellowship to enhance their candidacies for top Ph.D. programs, gaining admission with full funding at institutions such as Brown and Harvard universities and the University of California, Berkeley, said Dr. Joy Viveros, fellowship advisor and campus coordinator for the California Pre-Doctoral Program at SF State. “Several of our pre-doctoral scholars have gone on to win nationally competitive fellowships, such as the National Science Foundation Graduate Research Fellowship and the Ford Foundation Predoctoral Fellowship, both of which are career-changing awards for future faculty and researchers,” she added.